Zamioculcas zamiifolia also known and the Zanzibar Gem or ZZ Plant is a plant that is native to southeastern Africa. It was first introduced as an indoor plant by Dutch growers in the 1990s. These plants were a great choice for the indoor plant market because they’re practically impossible to kill, look great, and help improve indoor air quality. Their super easy care requirements and tolerance of low light conditions resulted in them popping up in malls across the US. (That is if your local mall was fancy and sprung for live plants inside.) However, you might’ve even thought they were fake due to their waxy leaves. I have one on my desk, and people mistake it for an artificial plant all the time. 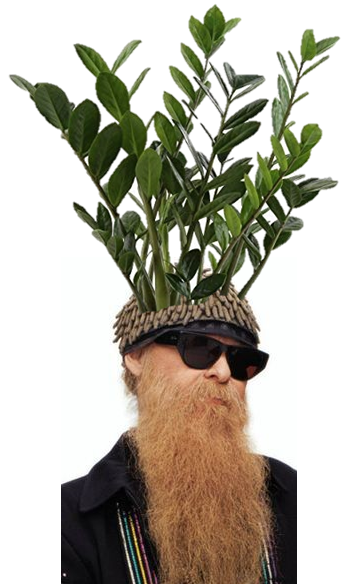 The ZZ Plant is a great plant for people with even the brownest of thumbs due to its unique characteristics. While it is an herbaceous plant, it grows from a stout succulent rhizome (bulb) that acts as a reserve of water. It is normally evergreen, but loses its leaves during drought, surviving droughts due to the large potato-like rhizome that stores water until rainfall resumes. Zamioculcas zamiifolia contains an unusually high water contents of leaves and has an individual leaf longevity of at least six months, which may be the reason it can survive extremely well under interior low light levels for as much as four months without water! Over-watering can kill this plant; erring on the side of dryness is preferable to risking tuber rot. Do not use leaf shiners. A quarter or eighth strength liquid fertilizer such as fish emulsion or worm-cast liquid may be used once a month at the warmest period for potted specimens. Bright, indirect light is best for Zamioculcas, although it will tolerate lower light levels. ZZ Plant is part of the Araceae family which is well known for many poisonous genera, such as Philodendron, and contains calcium oxalate. Needle-like calcium oxalate crystals could irritate different sensitive skin parts, mucosa, or conjunctiva like the eyes and mouth. Speculations and hysteria during the 2010s led to a belief that ZZ could be extremely poisonous. Extreme versions of this rumor claimed that the plant could cause cancer and was even dangerous to touch leading people to wearing gloves when handling it. Given the facts that the plant has been used externally in traditional medicine, is a very common office plant, and is cultivated on a large scale, it is safe to assume that Zamioculcas zamiifolia is not very toxic. So, to sum things up concerning the ZZ Plant, if you just got paid, this sharp dressed plant is a rough boy or I guess it could be a bad girl too. So if you’re looking for the perfect plant for your Avalon hideaway, groovy little hippie pad, or ninja shack, look no further than the ZZ Plant. I’m feeling a bit delirious from working all these ZZ Top song titles (italics) into this closing paragraph so I think I’ll give it up. I thank you.